18 City / 25 Highway. IT IS FOR OUR PROTECTION AND YOURS. (WE ARE STATING OUR OPINION OF THIS VEHICLES CONDITION AND OPERATION). 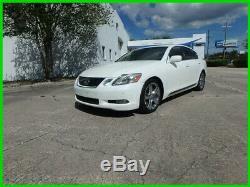 THIS IS A 2006 LEXUS GS430, HAS A CLEAN CLEAR AUTO CHECK REPORT WITH NO ACCIDENT AND A CLEAN CLEAR TITLE, ITS THE V8 ENGINE. EXTERIOR IS IN NICE SHAPE, BEAUTIFUL FACTORY PEARL WHITE PAINT, NO RUST, NO MAJOR DAMAGE, HAS A SMALL CRACK IN THE FRONT BUMPER COVER (RIGHT IN THE MIDDLE), SEE PIX. BUT OTHERWISE AND OVER ALL LOOKS GREAT, VERY CLASSY LOOKING. INTERIOR IS IN NICE SHAPE, NO RIPS OR TEARS, APPEARS TO HAVE BEEN A NON SMOKERS CAR, DON'T APPEAR TO HAVE BEEN ABUSED. RUNS AND DRIVES GREAT, NO WARNING LIGHTS ON THE DASH, HITS THE ROAD LIKE YOU EXPECT A LEXUS TO DRIVE, VERY SMOOTH DRIVING CAR. WE WILL BE HERE FOR YEARS TO COME GIVING GREAT DEALS AND EXCELLENT CUSTOMER SERVICE! PLEASE VIEW THE OPTIONS LIST AS THE VEHICLES OPTIONS ARE LISTED. REASONABLE PRICING AND A GREAT VALUE. Engine Description: 4.3L V8 32V. Wheels Spare Rim Type: Steel. Stabilizer Bar: Front And Rear. Center Console: Full With Covered Storage. Door Pockets: Driver, Passenger And Rear. Overhead Console: Mini With Storage. Steering Adjustment: Tilt And Telescopic. Steering Power: Speed-Proportional Electric Power Steering. Power Mirrors: Power Remote W/Tilt Down. Reverse Tilt Mirror: Dual Mirrors. Memory Features Number of Drivers: 3. Air Filtration: Interior Air Filtration. Trunk Lights: Cargo Area Light. Center Console Trim: Leather/Genuine Wood. Mats: Carpet Front And Rear. Reading Lights: Front And Rear. Steering Wheel Trim: Leather/Genuine Wood. Vanity Mirrors: Dual Illuminated Vanity Mirrors. Door Reinforcement: Side-Impact Door Beam. Head Airbags: Curtain 1St And 2Nd Row. Headlights Auto Delay: Auto Delay Off. Rear Center Seatbelt: 3-Point Belt. Tie Downs: Cargo Tie Downs. Front Head Room: 38.8 Inches. Front Hip Room: 54.4 Inches. Front Shoulder Room: 56.3 Inches. Front Leg Room: 43.5 Inches. Rear Head Room: 37.0 Inches. Rear Hip Room: 51.4 Inches. Rear Leg Room: 36.4 Inches. Rear Shoulder Room: 55.1 Inches. Ground Clearance: 5.1 Inches. Max Gross Vehicle Weight: 4,674 Lbs. Curb Weight: 3,745 Lbs. THIS ACHIEVEMENT REPRESENTS OUR DEDICATION TO OUTSTANDING CUSTOMER SERVICE! Most of our auctions are "No Reserve" 5-Day format auctions! We hope these quick style auctions help you secure a vehicle in a timely manner. We have been in automotive industry for 80 years (combined partner knowledge). We are experts in determining the best units at the best price. This has been our practice for 15 plus years now and it has worked out great. We will try to give you the help and service you deserve without the big dealer shopping hassle. We have low overhead so we can keep the cost per unit so low that we can't be undersold. We mostly deal in new car dealer trade in's, bank repossessions and lease turn in's. We hope we can service your vehicle needs if not now maybe in the future. Thank You, from all of us at Auto Depot Inc! PLEASE READ ALL CONTRACT TERMS AND CONDITIONS. Don't wait until the last minute to do this as it takes a little time. We need valid proof of who you are and your legal age. Please keep in mind these are used vehicles and not new vehicles. Please expect normal wear and tear unless stated otherwise in the ad. Please be advised that used vehicles will have typical cosmetic scratches and dings inherent for their age and use, all mechanical parts are subject to fail. We often go through several hundred vehicles a month. If the battery goes dead the radio in your vehicle may become inoperative and require a programmable radio code before use, programmable radio codes can be obtained at your local new car dealer where that make and model of the vehicle is serviced. In the event of any legal litigation the governing county shall be Duval County, Florida. The petitioner will be liable for all attorney and court costs incurred by Auto Depot Inc. Auto Depot Inc is a. Independent Auto Dealer in Jacksonville Florida. Specializing in the wholesaling of quality vehicles of all years, makes and models. Most of these vehicles are better maintained as when they are turned in they have to be inspected by the leasing companies agent and the owner is charged back for abnormal wear and tear, so they tend to take care of a leased car better or it could cost them thousands of dollars in penalties. Auto Depot Inc does not guarantee any state inspections or emissions testing on any vehicle we sell. Manufacturers warranties may still be applicable. Any loan obtained for a vehicle must be PRE-APPROVED. We will guarantee your lender in writing that their lien will be placed on the title. Make sure when using an online lending source that you specify to the lending institution that we are a licensed and bonded independent used car dealer in The State of Florida, so they can send you the proper check, we are not a franchise dealer. No escrow payments are accepted. All out-of-country outside the U. The companies we use are dependable, have great rates and are fully insured. We are not responsible for any delays in the transport process, delays can happen for reasons not under our control including but not limited to scheduling conflicts, weather and transportation equipment failure and/or service. These costs have been absorbed by the dealer for a while and is getting quite expensive. If you watch the sales price of our auctions you can see why we can't afford this cost because we sell at true wholesale! Please no calls after 10 p. 7949 Atlantic Blvd Suite 107. Check out similar vehicles in our inventory. Create Professional Listings Fast and Easy. IT IS FOR OUR PROTECT. The item "2006 Lexus GS LEXUS GS430 PEARL WHITE MARK LEVINSON SOUND CHROME WHEELS" is in sale since Sunday, April 7, 2019. This item is in the category "eBay Motors\Cars & Trucks\Lexus\GS". The seller is "99noreserve" and is located in Jacksonville, Florida. This item can be shipped to North, South, or Latin America.